Sister Irene O'Neill, CSJ, Ed.D. is a Sister of Saint Joseph of Carondelet. Sister Irene is the Chair of the Bethlehem University Foundation Board of Directors, and an Ex-Officio member of the Bethlehem University International Board of Regents. In addition to her full-time job as President of a global Non-profit, Sisters Rising Worldwide, Sister Irene is also a Trustee at Avila University, in Kansas City, Missouri. Previously, Sister Irene served for nearly 20 years as the Executive Director of the Sisters of S. Joseph of Carondelet Ministries Foundation. Earlier, she was the Curriculum Coordinator for the Saint Paul Minneapolis Archdiocesan Elementary Schools, Adjunct Faculty member at the University of Minnesota and the University of Saint Mary Graduate School and an elementary school teacher. In her free time, Sister Irene loves to read, garden, and kayak. 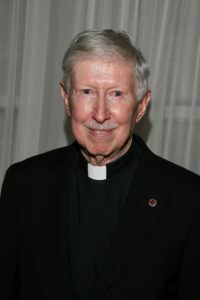 Bishop Madden was ordained a priest for the Benedictine community of Saint Paul’s Abbey in Newton, New Jersey, in 1967. He helped establish a Benedictine community in New Orleans to support the pastoral work of the Archdiocese of New Orleans. The then-Father Denis was incardinated into the Archdiocese of Baltimore in 1975. During the course of his priestly ministry, Bishop Madden has served as the Director of the Pontifical Mission for Palestine, living at the Tantur Ecumenical Institute. He was also the Director of the University of Notre Dame Studies Abroad Program in Jerusalem. From 1996-2005, he served as Associate Secretary General of the Catholic Near East Welfare Association (CNEWA), working on behalf of the Holy See in those lands in which from ancient times the majority of Christians belonged to the Eastern churches. Among his duties while with CNEWA, Bishop Madden served as the chief negotiator among the three ecclesiastical authorities responsible for repairing the dome of the Church of the Resurrection in Jerusalem. Bishop Madden was consecrated a bishop by His Eminence William Cardinal Keeler at the Cathedral of Mary Our Queen on the 24th of August 2005. Though he is officially retired, Bishop Madden continues to serve the faithful of the Archdiocese of Baltimore as Vicar for the Urban Vicariate. He is a member of the Equestrian Order of the Holy Sepulchre of Jerusalem. Benjamin Monastero III joined Bethlehem University Foundation Board of Directors in October of 2010 where he has served as the Foundation's Treasurer since 2010. He currently chairs the Finance and Investment Committees, and is a member of the Executive Committee. He is a Knight Commander with Star in the Equestrian Order of the Holy Sepulchre of Jerusalem where he served in numerous capacities over the years including the Investiture Committee Chair, Treasurer and Chancellor of the Middle Atlantic Lieutenancy, USA. 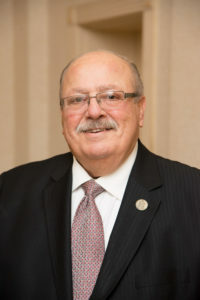 Mr. Monastero held numerous leadership positions within the Departments of Defense and Department of Homeland Security including the Senior Executive Service. He holds an M.B.A. in International Business and is a Certified Public Accountant. Mr. Salameh holds a MBA from the University of San Francisco, and a bachelor’s degree in mechanical engineering from California State University. He has held senior level positions in the management and technology consulting industry, including Booz Allen Hamilton, where he was Executive Vice President and Senior Partner, and CH2M where he was Director of International Infrastructure Business. Mr. Salameh is a recognized global leader in transportation and infrastructure planning and development. He led the strategy, growth, and execution of businesses at the executive level for multiple companies and created businesses across major cities around the world. Mr. Salameh played key roles in major international conferences as well as authoring multiple papers focused on issues such as public-private partnerships, advanced technologies, and management. Mr. Salameh serves on the Boards of the United Palestinian Appeal; Rubix Holding; and UNRWA, USA where he is the Chairman of the Board. He and his wife, Suava, are Gold Patrons of the Bethlehem University Foundation. Born in Haifa, Dr. Abu-Ghazaleh earned a MB.B, Ch. Degree (equivalent to M.D.) from the Ain Shams University Medical School in Cairo, after receiving his undergraduate degree from Nahara College in Cairo, Egypt. He completed residencies and graduate work in Obstetrics and Gynecology at the University of South Dakota Affiliated Hospitals and in Gynecologic Oncology at Duke University Medical Center. He then established a private practice in South Dakota. Dr. Abu-Ghazaleh has over four decades of experience as a gynecologic oncologist and is the author of numerous articles on gynecology and oncology. From 2000-2006, he was appointed by President Clinton to the National Cancer Advisory Board. He is a member of the Board of Governors for the Arab Western Institute, a member of the Advisory Board of the Holy Land Christian Ecumenical Foundation, and a Board Member of the American Task Force on Palestine. Dr. and Mrs. Abu-Ghazaleh are Knights and Ladies of the Equestrian Order of the Holy Sepulchre of Jerusalem. Dr. Abu-Ghazaleh is a member of the Order of Malta. Dr. Samir and Mrs. Mary Abu-Ghazaleh are Legacy Patron of the Bethlehem University Foundation. Dr. and Mrs. Abu-Ghazaleh are the underwriters of the Patrons of the Bethlehem University Foundation. Born in Bethlehem, Mr. Aburdene is President and CEO of Rock Creek Corporation, an investment company. 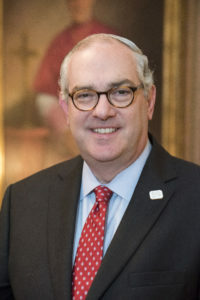 He holds a master’s degree from the School of Foreign Service at Georgetown University, specializing in International Economics, and a Bachelor of Arts degree in Economics from the University of Connecticut. He has been working in the world of finance and investments for over four decades. He is currently President and CEO of Rock Creek Corporation, an investment company. Mr. Aburdene is a member of several Boards, including the Bethlehem University International Board of Regents, the Board of Advisors for the Center for Contemporary Arab Studies at Georgetown University, the Board for the American Friends of the Bethlehem Development Foundation, and the Board of Directors for UNRWA. Mr. Aburdene and his wife, Annette, are Legacy Patrons of the Bethlehem University Foundation. Ms. Acuff earned her Juris Doctor degree with the Catholic University of America, Columbus School of Law. She also has a Bachelor of Arts degree in International Economics and Finance from the Catholic University of America. 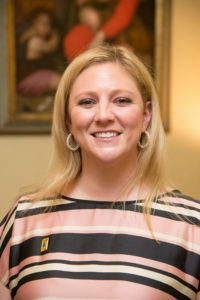 She has spent her professional career in development and fundraising, largely with the Catholic University of America and then Tulane University, where she is currently employed. She has also served as a Fundraising Consultant and Advisor to Former Speaker of the House of Representatives, the Honorable Newt Gingrich. A member of the Virginia State Bar, and a Member of the Council for the Advancement and Support of Education, Ms. Acuff has been a part of a number of organizations, including serving as Treasurer of the Board for Operation Spark, Fundraising Consultants for the Saint Bernard Project, Fundraising Consultant, Former Advisory Board member for Son of a Saint, and Athletics Advisory Board member for the Catholic University of America. Born and educated in the United Kingdom, Vicki Downey moved to New York in 1999. She was responsible for the immigration and importation department of a large Italian shoe company before transferring to a small independent immigration law firm in 2002. In 2006, she left the corporate world to focus on her charitable endeavors. She initially concentrated on The Daughters of the British Empire, serving four years as the New York State President, and then its National President for an additional three years – she still serves as an Honorary National Vice President. In 2012, she became the Chief of Staff of the Mountbatten Institute, retiring in 2015. She remains as President of her own small logistics company. She is a World Fellow of the Duke of Edinburgh Award Program and is on the Board of The Allied Forces Foundation, The Anglosphere Society, and the Victoria Home. Most recently, she has been concentrating on working with the Halo Trust to clear landmines in the Holy Land, left over from the 1967 Six-Day War, particularly at the Baptismal site of Jesus. In 2004, she became a member of the Equestrian Order of the Holy Sepulchre of Jerusalem and was appointed to the Lieutenancy Council in 2011. She was appointed Lieutenant of the Eastern Lieutenancy in January 2016, becoming the first woman to hold the position in the Eastern Lieutenancy. The Reverend Monsignor Walter R. Rossi, J.C.L., M.Div. Monsignor Rossi was ordained to the priesthood for the Diocese of Scranton in 1987 after earning a Bachelor of Science in Accounting at the University of Scranton and a Master of Divinity at Saint Joseph’s College and Seminary in New York. After his ordination, then Father Rossi served as Parochial Vicar and teacher at a number of parishes and schools in that diocese, as well as later serving as the Director of Pilgrimages. 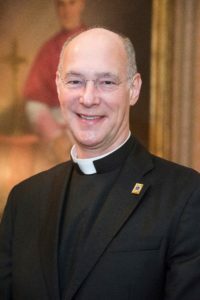 After earning his licentiate in Canon Law at the Catholic University of America, he was assigned as the Associate Rector and Director of Pilgrimages at the Basilica of the National Shrine of the Immaculate Conception. In 2004 he was named a Chaplain to His Holiness by Pope John Paull II, and in 2005, Monsignor Rossi was appointed Rector of the Basilica. As part of his duties as rector, he spends significant time fundraising for capital projects, operational expenses, and programmatic support. Monsignor Rossi is a member of the Canon Law Society of America; the National Association of Shrine and Pilgrimage Apostolate; the Knights of Columbus, Fourth Degree; a Knight Commander of the Equestrian Order of the Holy Sepulchre of Jerusalem; and the Catholic University of America Board of Trustees. Monsignor Rossi has received several notable awards and honors including the UNIC National Presidential Award, the Frank J. O’Hara Award from the University of Scranton, and the Pro Ecclesia et Pontifice medal by Pope Francis. A highly regarded and well-respected legal expert on labor and Middle East issues, George Salem has had a long career working in government and the private sector. For fourteen years, he was a partner at the law firm of Akin, Gump, Strauss, Hauer & Feld, LLP, where he headed the firm’s Middle East and U.S. Department of Labor practices. 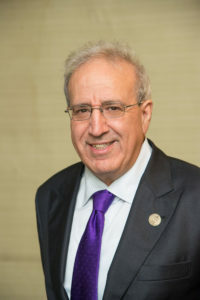 George Salem co-founded the Arab American Institute and currently serves as its Chairman, and he serves as Treasurer of United Palestinian Appeal. He is also a member of the Board of Directors for the American Friends of the Bethlehem Development Foundation. He is a member of the Board of Advisors for the Center for Contemporary Arab Studies at Georgetown University. 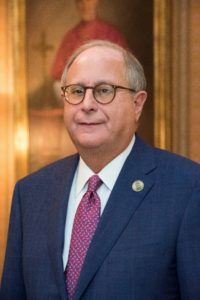 In 1985, he was appointed Deputy Solicitor, and in 1986 he was appointed by President Ronald Reagan as the Solicitor of Labor of the United States of America, a position he held until 1989. He has served as a member of the Board of Directors of the Overseas Private Investment Corporation and as Chairman of the Tripartite Advisory Panel on International Labor Standards, the legal arm of the President’s Committee on the International Labor Organization. 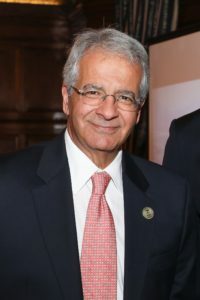 He is the past president of the National Association of Arab Americans and has served on the Board of Directors of the American-Arab Anti-Discriminatory Committee. He was also named to the U.S. Advisory Commission on Public Diplomacy’s Advisory Group on Public Diplomacy in the Arab and Muslim World. George Salem has received the Ellis Island Medal of Honor. A resident of Texas, Mrs. Breda Shelton received her Elementary School Teaching Credentials from the University of California at Riverside, after receiving her Bachelor of Arts degree from the Catholic University of America. The majority of her sixteen years of teaching was with Saint Maria Goretti Catholic School with the Diocese of Fort Worth. 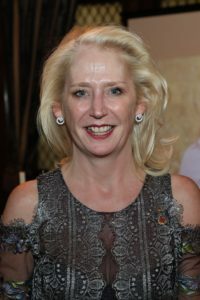 Mrs. Shelton is a member of several Boards and associations, including Catholic Charities of Fort Worth, Texas Board of Directors; Basilica of the National Shrine of the Immaculate Conception, Board of Trustees Member; The Gingrich Foundation, Board of Directors Member; Fort Worth Academy, Board of Trustees Member. She is also a Member of the Bishop’s Guild of Fort Worth; a Bronze Patron of the Bethlehem University Foundation; Member of the Catholic University of America Alumni Association, and Thomas Aquinas Society Member of the Catholic University of America; a Member of The Irish Angels; and a member of the Equestrian Order of the Holy Sepulchre of Jerusalem. Mrs. Shelton and her husband, George, are Bronze Patrons of the Bethlehem University Foundation. Mr. Starshak graduated from the University of Notre Dame and was designated a Woodrow Wilson Fellow. He earned further degrees in economics from Oxford University. Commissioned in the U.S. Naval Reserve, he was released from active service as a Lieutenant Junior Grade, after which he joined the Naval Reserve Intelligence Program. After a number of assignments, he retired as Chief of Staff of the Midwest Intelligence Area with the rank of Captain. Mr. Starshak holds an MBA from the University of Chicago. He worked for The Northern Trust Company for 16 years, as an investment banker. In 1991, he joined with others to form the investment banking firm of Starshak Winzenburgh & Co. The firm's clients include the University of Chicago and affiliates, Saint Xavier University, Illinois Institute of Technology, Illinois Wesleyan University, Illinois Student Assistance Corporation, New Mexico Student Loans, and other non-for-profit and private corporations. Mr. Starshak holds a mayoral appointment to the Chicago Board of Health, and he serves on the Loyola University Library Board and on the YMCA of Metropolitan Chicago Real Estate and Properties Committee. He is a Knight of the Equestrian Order of the Holy Sepulchre of Jerusalem. Mr. Starshak and his wife, Mary Clare, are Bronze Patrons of the Bethlehem University Foundation. Professor Barry Sullivan attained his Juris Doctor degree from the University of Chicago Law School after receiving an AB in Philosophy and Political Science from Middlebury College. He began his legal career as a law clerk to Judge John Minor Wisdom, United States Court of Appeals for the Fifth Circuit, New Orleans. 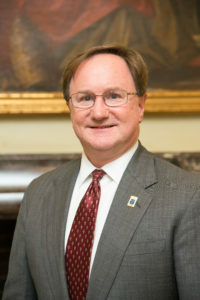 His career has included stints in the private practice of law, government service, the teaching of law and public policy, and university administration. 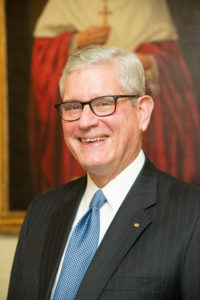 Among other things, he has served as an Assistant to the Solicitor General of the United States, as Vice-President and Dean of the Law School of Washington and Lee University, and as a partner in the national law firm of Jenner & Block, where he was a member of the Executive Committee and Co-Chair of the Supreme Court and Appellate Practice Group. 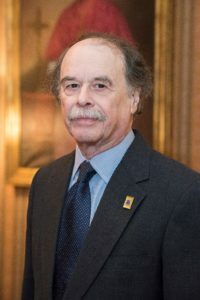 He has held many positions in the American Bar Association, including Founding Chair of the AIDS Coordinating Committee and is a Life Trustee of Catholic Theological Union at Chicago, where he previously served as Chair of the Academic Affairs Committee of the Board. Professor Sullivan has been a Fulbright Professor at the University of Warsaw, Visiting Fellow of Queen Mary College London, Fulbright Canada Chair at the University of Alberta, the inaugural Arthur Cox Research Fellow and Visiting Professor at Trinity College Dublin, and a visiting professor at the University of Bayreuth. His teaching and research interests include American and comparative constitutional law, administrative law, advocacy, the Supreme Court, and the legal profession. 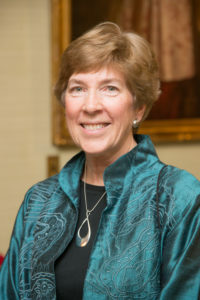 Professor Sullivan has received numerous awards, including the Legal Legends Award, Chicago Lawyer Chapter, American Constitution Society; John R. Regan Writing Award, National Academy of Elder Law Attorneys; Cook County Public Guardian’s Advocate of the Year Pro Bono Award; American Bar Association AIDS Coordinating Committee, Twentieth Anniversary Leadership Recognition Award; DePaul University Black Law Students Association, First Annual Progressives in the Profession Award, and other honors. He is a Life Member of the American Law Institute, a Fellow of Phi Beta Kappa, and a Fellow of American Bar Foundation. Mr. Warsaw received his Bachelor of Arts degree from the Catholic University of America and began his career working at the Basilica of the National Shrine of the Immaculate Conception in Washington, DC. 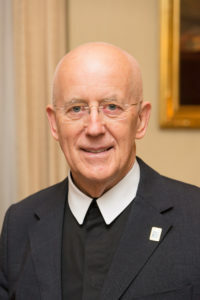 He joined EWTN in 1991, holding senior management positions in the areas of television production, satellite operations, and technical services before becoming EWTN’s President in 2000 and its CEO in 2009. In April 2017 he was appointed as a Consultor to the Holy See’s Secretariat for Communications by Pope Francis. 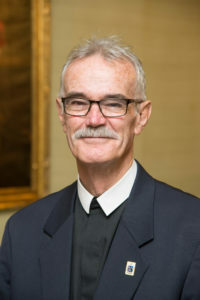 Mr. Warsaw serves on the Boards of Trustees of the Basilica of the National Shrine of the Immaculate Conception and the Catholic Distance University. He is a charter member of the Legatus’ Chapter in Washington, DC. Mr. Warsaw has a number of awards and recognitions including the Bowie Kuhn Award for Evangelization from Legatus; an Honorary Doctorate of Communications from Franciscan University of Steubenville; the Alumni Achievement Award from the Catholic University of America; Defender of the Faith Award from the Fullness of Truth Association; and an Honorary Doctorate of Humane Letters from Northeast Catholic College. Brother Peter Bray, FSC, is the 8th Vice Chancellor of Bethlehem University, assuming the role in February of 2009. He brings more than 30 years of Catholic education experience as a teacher, consultant, administrator, and expert in leadership and educational systems. Brother Peter complements his practical experience with a doctorate in Leadership Studies from the University of San Diego with a focus on leadership approaches that facilitate change in educational institutions. 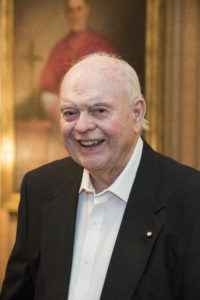 Prior to Bethlehem University, Brother Peter was the Director and CEO of the Wellington Catholic Education Center in New Zealand where he led the creation of a master’s level educational partnership with the Australian Catholic University and the utilization of online delivery for the Center’s educational programs. Brother Denis Loft, FSC, is an experienced educator and administrator from Australia. He was named the Vice President for Advancement at Bethlehem University in 2017. Beginning his career as a teacher, and a teacher trainer, Brother Denis has spent much of his career working for justice. Brother Denis spent 20 years of his career in Papua, New Guinea. Before joining the staff of Bethlehem University, he spent six years in South Sudan with a program called Solidarity with South Sudan which aims to create self-sustainable educational, health and pastoral institutions and programs that will help to empower South Sudanese people to build a just and peaceful society. Solidarity is a collaborative commitment of religious institutes of men and women. Solidarity with South Sudan’s programs focus on teacher training, nursing and midwife training, and pastoral services. 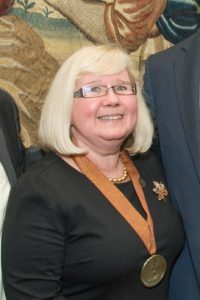 Professor McGettrick was Principal of Saint Andrew’s College of Education from 1985 until it merged with the University of Glasgow in 1999. 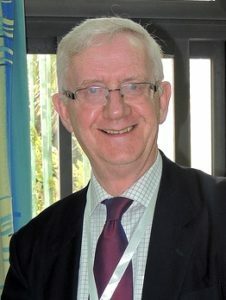 He then became Dean of the newly created Faculty of Education and was appointed to a personal professorship of Education, which he held until 2005 when he went to Liverpool Hope University. He is the Dean of Education at Liverpool Hope University. He is Chair of the International Board of Regents of Bethlehem University. He is also a member of the Board of Directors of the Saint John the Baptist Vatican Foundation, supporting education and culture in the Middle East. He is also the first Chairman of the Scottish Forum for Professional Ethics, and of the Hope Forum for Professional Ethics. He is Dignitary of Honor of the Grand Magisterium of the Equestrian Order of the Holy Sepulchre of Jerusalem and a member of The Holy Land Commission. Graduate of a Christian Brothers High School, Mr. Steger received a BBS from the University of Michigan. He was a commissioned officer in the US Navy, and his professional career was based on the life insurance business. He is well-known as a speaker and lecturer on applications of life insurance in estate planning and closely-held businesses. He is the Founder and former President of MANALIVE, an Archdiocesan youth ministry, and served on the board of directors of many organizations, including Saint Mary’s Press, CommonBond Communities, Vice President of the American Society of Chartered Life Underwriter and Vice President of National Association of Advance Life Underwriters. He is also a member of the Equestrian Order of the Holy Sepulchre of Jerusalem. Mr. John Steger became a member of the Bethlehem University Foundation Board of Directors in 2002 and served as its Chair from 2007 until 2011. Mr. Steger and his wife, Nan, are Legacy Patrons of the Bethlehem University Foundation. 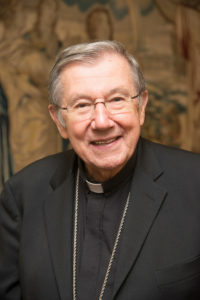 Monsignor Robert Stern was ordained a priest of the Archdiocese of New York in 1958 and served the Archdiocese for over 27 years in a variety of capacities including inner-city parish ministry, archdiocesan canonical and financial administration, coordination of archdiocesan Hispanic pastoral affairs, and lay leadership development. For the next 26 years he served the Holy See, leading two Vatican agencies, Catholic Near East Welfare Association and the Pontifical Mission for Palestine. Monsignor Stern is a graduate of Amherst College, prepared for priestly ministry at Saint Joseph's Seminary in Yonkers, and earned a doctorate in Canon Law from the Pontifical Lateran University in Rome. He holds honorary doctorates in Humane Letters from Amherst, Saint Thomas Aquinas College, and Bethlehem University. Monsignor Stern is a founding member both of the International Board of Regents of Bethlehem University, serving as its Chair from 1994-2007, and of the Board of Directors of the Bethlehem University Foundation, serving as its Chair from 1999 until 2006. He is also an Affiliated Brother of the Institute of the Brothers of the Christian Schools. He has the ecclesiastical ranks of Protonotary Apostolic, Mitered Grand Archimandrite of the Melkite Greek Catholic Patriarchate of Jerusalem, and Canon of the Basilica of the Holy Sepulchre. He is also a Knight Chaplain Grand Cross of the Equestrian Order of the Holy Sepulchre of Jerusalem. Monsignor Stern is a Legacy Patron of the Bethlehem University Foundation.